The possibilities are endless with pretzel pizzas! Go savory or sweet - some suggested variations are listed below the recipe. Oh, and these suckers are great on your barbecue grill too! 1. Remove pizza crusts from freezer. Place them golden side up, ready for toppings. 5. Place in the oven until all toppings are heated and melted…about 10-15 minutes or so. I like mine on the rack so it’s crispier. PIEROGI: Mashed potatoes, smoked Gouda, caramelized onions and green onions for color. MOZZARELLA, MARINARA & ROASTED RED PEPPERS: marinara, lightly sprinkle dry basil and oregano, chopped roasted red peppers, mozzarella cheese and pretzel salt. ROASTED RED ONIONS, GARLIC AND SMOKED GOUDA: smear roasted garlic on crust, sprinkle with roasted red onions and top with smoked Gouda. Sprinkle with pretzel salt and bake. LEMON, PESTO AND TOMATO: lemon EVOO (just a drizzle), pesto topping and sprinkle with pretzel salt and bake. When out of oven, top with freshly sliced tomatoes, cut and serve. ALMOND JOY: smear cinnamon honey butter (you can purchase this at Brezel) on crust and top with coconut, sliced blanched almonds, brown sugar (I usually make a coconut, almond and brown sugar mixture in advance), dark chocolate crumbles and salt. Brēzel makes hand-rolled Bavarian-style pretzels with a kick. 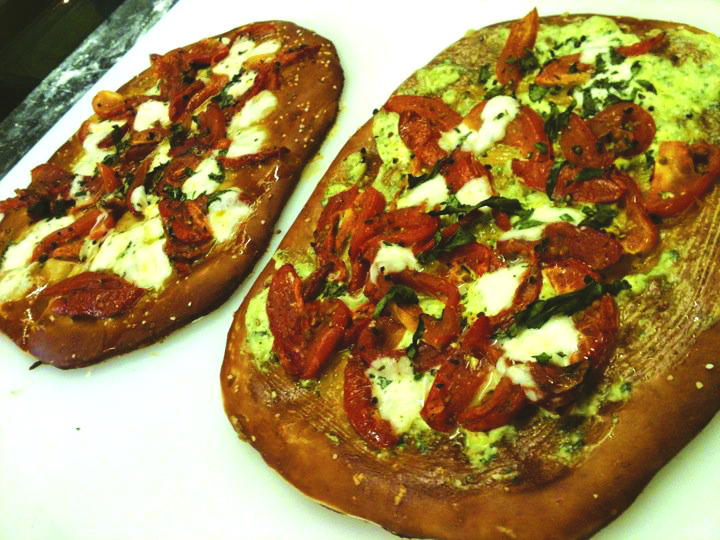 We specialize in gourmet pretzel products including pretzel buns and pizzas made to order, just for you. Hand-rolled and blissfully buttery, Brezels are authentic Bavarian-style pretzels at their finest. Crafted one at a time, each Brezel is dipped in a traditional pretzel wash.
All content © Copyright 2013, Brezel, LLC. All rights reserved.